A ham and tomato sandwich gets a cheesy, golden-brown crunch when it's spread with Italian dressing and Parmesan and given a quick toss in a skillet. 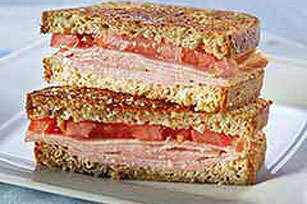 Fill bread slices with ham and tomatoes. Mix dressing and cheese; spread onto outside of sandwich. Cook in skillet sprayed with cooking spray on medium heat 2 to 3 min. on each side or until golden brown on both sides. Do not grill the sandwich but instead toast the bread slices before using to assemble the sandwich as directed.